Fred Raffetto marked the milestone of turning 50 with a memorable feat, completing the NYC Marathon on Sunday. 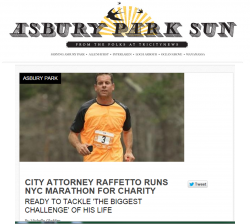 In addition to marking a personal milestone, Raffetto used the race to raise money through Team For Kids, New York Road Runners’ Youth and Community Services program. The funds they raise provide free or low-cost health and fitness programs to kids who would otherwise have little or no access to regular physical activity. This entry was posted on Wednesday, November 4th, 2015 at 10:30 pm and is filed under Frederick C. Raffetto, Municipal Law, News.